Google's Gmail has a lot of features when compared to other Email providers. In those features sending SMS from Gmail account is one of the most useful one. Till few days back it is not possible to send SMS to people who are living in India and now one can send SMS to certain service providers from Gmail account. Below is the detailed step by step procedure on how to activate the SMS feature and how to send SMS from Gmail account. 1) First you have to open your Gmail account. 2) On the top right side of your Gmail account you can find a Gear symobl. 3) Click on it and go to Settings. 4) In the settings you can find different options. 5) Click on the Labs option. 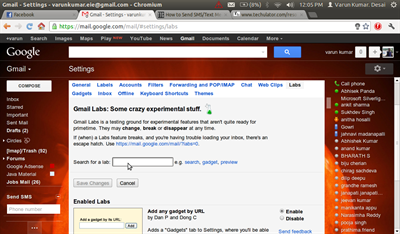 6) Once you click on the lab option you can find a search box. 7) Just type "SMS" in the search box. 8) You can find two lab features. 1) SMS (text messaging) in Chat 2) SMS in Chat gadget. 9) Enable both the lab features. 10) once you enabled both the features refresh your Gmail account or signout and signin to your Gmail account. 11) Now in the chat list you can find Chat and SMS. 12) Now if you want to send a SMS just type the number and select "Send SMS". 13) Once you typed the number Gmail will ask you to enter the Contact name. Just enter the contact name and save the number. 15) If you are in India you can send SMS from your Gmail account to the following service providers. 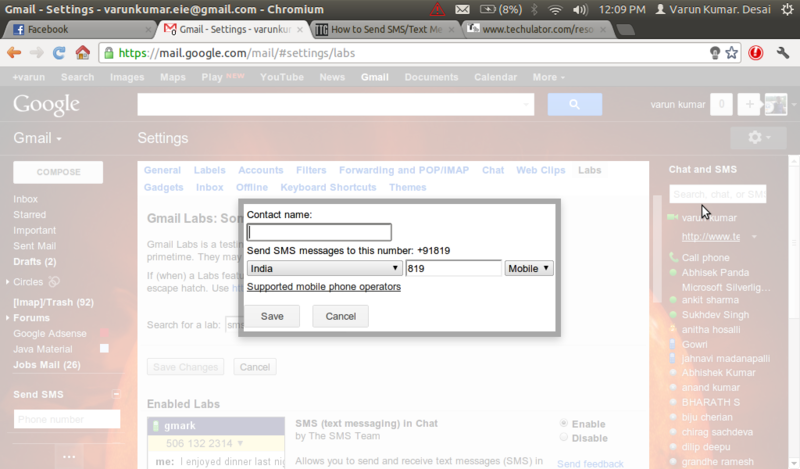 You may watch the video on how to send SMS from GMail directly at YouTube. I don't think this still works to send SMS from Gmail. Did it work for anyone else? Moreover, now there are hundreds of other programs to send free SMS and no need to use Gmail.